A1: licensed courtesy of Premier Records ltd.
A2: from Polydor Nigeria 7" single "La La La b/w Poorman No Get Brother" (20686037) licensed courtesy of Premier Records ltd.
A3: from Afrodisia LP "Horizon Unlimited" (DWAPS 2089) (C)1979. recorded at Decca Studios London. African Backing track recorded at L.A.K. B1: from unreleased "Shango" album tapes. recorded in London circa 1976 (P)Strut licensed courtesy of Peter King, Personnel unknown. B2: from EMI Nigeria LP "Sahara All Stars Band Jos" (NEMI (LP) 035) licensed courtesy of Ivory Music ltd. Personnel unknown. C1: from Universal / Barclay CD "Open and Close/ Afrodisiac (549 240-2)(P)1971 FKO. recorded at EMI Studio Abbey Road, London. C2: from EMI Nigeria LP "Tunji Oyelana & The Benders" (NEMI 0268)(P)1975 EMI Nigeria. licensed courtesy of Ivory Music ltd. Personnel unknown. C3: from the London 7" single (FL 13361) An Afrodisia Production (P)1972 Decca Record Co ltd. licensed courtesy of Afrodisia ltd.
D1: from the HMV 7" single ' Ogbu Achara b/w Dancing Time" (HNS 1405)licensed courtesy of Ivory Music ltd.
D2: from the Capitol / EMI LP "The Dawn Of Awareness" (ST-11327) (P)1974 EMI Nigeria. licensed courtesy of Ivory Music ltd.
D3: from Afrodisia LP "Bala Miller & The Great Music Pyrameeds Of Afrika" (DWAPS 2081)(P)1979 Afrodisia ltd. licensed courtesy of Afrodisia ltd.
E1: from Phonogram LP "Sasakosa Excitement" (POLP 002) (P)1975 Polydor Nigeria. 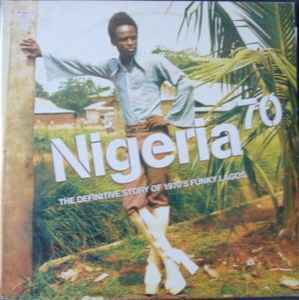 licensed courtesy of Premier Records ltd.
F1: from the Cap Records LP "Ajomasé" (CAP 1)(P)1980 CAP Records, licensed courtesy of Cap Records. F2: from the Sunny Alade LP "Synchro Series" (SALPS 37) (P)1983 Sunny Alade Records ltd. licensed courtesy of Sunny Alade Records. Gatefold Sleeve has inside text/ history notes.